Wednesday 19th September, 7 for 7.30pm at the Sussex Produce Cafe. 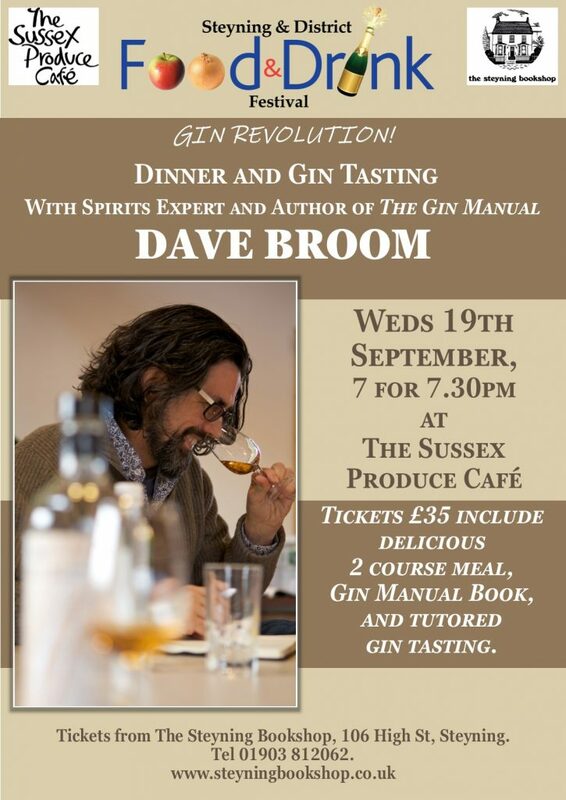 In association with Steyning Food and Drink Festival, and The Sussex Produce Cafe, we are excited to welcome Dave Broom, Glaswegian drinks writer and spirits expert extraordinaire, who will join us at the Sussex Produce Cafe for a dinner and gin-tasting evening. Dave has written over a dozen award-winning books on whisky, gin, rum, and the art of bartending, is a contributor to numerous whisky journals, and lectures widely on wine, spirits and distillery. Over a delicious 2 course dinner, Dave will lead us through tastings of a range of artisan gins, and will also share insights into the history and manufacture of gin, and how best to enjoy its subtle flavours. Tickets £35 to include superb 2 course dinner, gin-tasting, and a copy of Dave’s new book ‘Gin:The Manual’.